That is not a simple statement as Sunday night and Monday, dog and I were both sick. I don't take a lot of sick days, in fact, I try not to be sick as work doesn't go away just because I am sick. And it didn't but that's ok. I am much better. The good news is that Samson, aka Attila, aka Hotel Bravo, aka HB, aka Handsome Boy is fine now. Late Sunday night/early Monday am, he got a little, okay a lot, sick and every two hours, we were outside doing the diarrhea run. Who knows what he ate, or got into but boy it was coming out with a vengeance. For those of you who have dogs or have had dogs, after diarrhea, comes THE GAS. WHEW DOGGY, is he gaseous. I mean stink-o-rama. So tonight, while we are grateful that he is ok, he is not Handsome Boy, rather he is Stinky Boy. Wish we had smell-o-vision to share this joy. Tonight the Red Wings are playing Colorado. This is always a good match-up and a very intense game. 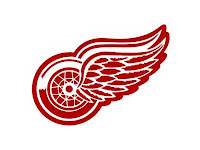 Detroit is having an unbelievable season and I sure hope that they can sustain this level of play and intensity! Since Tuesday is my night to cook, we enjoyed Buffalo Wild Wings, sharing Teriyaki, Spicy Garlic and Carribean Jerk. They were delish. Oh yeah...GO BLUE JACKETS !!! Rex used to pass some noxious air biscuits then look at you all offended...like YOU were the guilty party. That's just wrong. Hope Samson (and you, too) is feeling better and the green haze is starting to clear. See you guys soon. We'll head to GR on Friday to start the rounds.